Heather “Digby” Parton grew up all over the world as the daughter of a peripatetic employee of the vast American Military Industrial complex. After a traditional 1970s-style misspent youth and fitful education, she landed in Hollywood and spent a couple of decades as an executive in the film industry, pushing the usual paper and making the usual deals. Out of a need to vent her frustration with the state of America’s politics, she began writing daily political analysis, punditry, random musings and snark on her website “Hullabaloo” in 2002. It soon turned into a full-time vocation, obsession, and, surprisingly, a new career. Digby became one of the leading innovators of the new form of writing called “political blogging,” most succinctly defined as an informal but in-depth rolling conversation about the issues of the day. 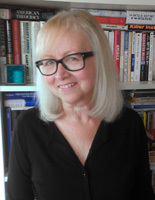 In the process, she caught the attention of columnists such as James Wolcott, who declared “Digby’s blog is a Paul Revere gallop through the pitched night of the Bush years,” and Paul Krugman, who frequently linked to her posts, introducing her as “the blogger Digby — who is, by the way, one of the best writers you’ll ever encounter, on or off the Internet.” She gained a devoted following among political junkies of all stripes that lasts until this day. Her blog has influenced many of the next generation of liberal intellectuals and journalists. After reading her site and striking up a personal friendship, historian Rick Perlstein acknowledged her one of his most important intellectual partners in his seminal work Nixonland. Chris Hayes cited her thesis about Washington culture called “the Village” in the first chapter of his book Twilight of the Elites. Glenn Greenwald credits her blog with inspiring him to start writing his own. In many ways, Heather “Digby” Parton is the blogging godmother to a generation of new voices who grew up over the last decade to prominence at major journals, news sites, and on public affairs television. Just say “Digby” to any of hundreds journalists and commentators, and you’ll get an appreciative smile. Digby writes constantly, engages readers, quotes generously, and exists inside today’s 24-hour news cycle with both her fearlessless and her point of view intact. She has been filing daily updates to her Hullabaloo blog since 2002, creating one of the last independent sources for progressive commentary, incisive political analysis and media criticism. She is a daily blogger who is a must-read in the halls of power, among activists and organizers, and by the national media she sometimes criticizes with acerbic accuracy. Digby’s 2013 commentary on economic inequality and the ongoing battle inside Washington on cutting social spending was stoic in defense of both the powerless and the American middle class. She took official Washington to task on behalf of those too often left out of the American Dream. She criticized the political brinksmanship over the Federal budget and examined its real-world victims. She took on both welfare reformers on the left and budget slicers on the right, providing context for a steadily decreasing middle class and more Americans living in poverty, particularly children. Digby chided deficit hawks for ignoring the growing poverty picture, pushed back on Democrats seeking a “grand bargain,” and analyzed how voters sometimes ignore their own economic self-interest. It’s her sharp rhetorical blade that influences so many other voices, creates a real network of thought, and urges people to action. She has taken on politicians — both Democrats and Republicans — for abandoning the underpinnings of our national promise. And she has turned her often-withering gaze on the Beltway media — or in Digbyspeak, “the Villagers” — with razor-sharp media criticism.